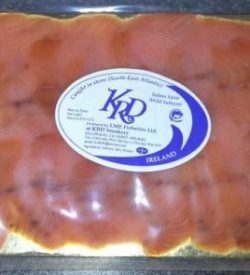 K.R.D have been preserving the wild salmon harvested from the river Laune which runs beside our smokery in Killorglin since 1782. 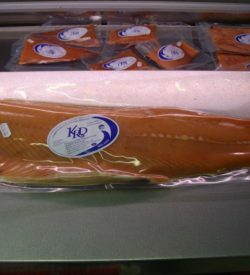 Our home smoked salmon has a unique flavour and is of unrivaled quality. Perhaps because we use only freshly caught salmon from the river Laune in our smoked wild salmon products and prepare the fresh salmon for the smoker immediately after harvesting. After curing the the fish are cold smoked using a secret medley of hardwoods but oak wood is the predominant ingredient. The smoked sides are vacuum packed unsliced to further preserve the delicate flavours.